Myrrh first came on the scene thousands of years ago when it was given as a gift along with frankincense and gold to Jesus Christ from the wise men, as stated in the New Testament. That wasn’t the only time it was mentioned however, myrrh was mentioned 152 times for its abilities to help embalm the dead, and to work as a medicine and a spice. So what exactly is myrrh you ask? Myrrh is a deeply aromatic resin that comes from a tree called Commiphora myrrh, native to the Middle East and Africa. As far as botanical composition, myrrh essential oil is common to frankincense essential oil. Today, myrrh essential oil is as popular as ever, commonly used to treat many ailments while being valued to its spicy scent. Myrrh essential oil has been revered for its medicinal properties for centuries. As it turns out, many of myrrh’s essential oils many benefits still hold up. Myrrh is steam distilled from the resin of the Comminphora myrrh tree. Ancient Egyptians used the deeply aromatic scent in perfumes and incense. The people of Ancient Greece valued myrrh essential oil to help disinfect wounds and to speed up the healing process. Today, the medicinal properties of myrrh essential oil make it one of the most popular and widely used essential oils. Myrrh essential oil is a powerful antibacterial. This natural antibiotic prevents the system from falling prey to infection due to food poisoning, colds, and wounds. Unlike over-the-counter antibiotics, myrrh essential oil does not have adverse side effects and is not harsh on your liver and stomach. This is why myrrh essential oil has been used for centuries to treat wounds. Myrrh essential oil prevents germs and viruses from invading and attacking the body. It helps protect the body from the flu, cold virus, and even food poisoning. Myrrh essential oil is a great way to bolster your immune system, particularly during cold and flu season. Myrrh essential oil has also been valued for centuries for its ability to treat fungal infections such as athlete’s foot and ringworm. If you hate the idea of microbes and fungus invading your body, consider keeping a little vial of myrrh essential oil in your medicine cabinet. Myrrh essential oil is considered an antiseptic substance—meaning that it will prevent cuts and wounds from becoming septic and leading to infection. Next time you get a cut or a minor wound, consider treating it with diluted myrrh essential oil to ensure complete and infection-free healing. It may help with tetanus somewhat, but there is no substitution for staying current on your tetanus shots. Currently, there is a medication containing myrrh that helps treat the parasitic infection fascioliasis. This infection occurs when you swallow aquatic algae and other plants containing the parasite. Myrrh helps tackle the infection by treating the symptoms along with helping to eliminate the parasites eggs and feces in the system. When it comes to tightening things up and holding everything together, myrrh essential oil is a wonderful astringent. This means myrrh helps strengthens gums and the hold they have on your teeth and helps strengthen your scalp and the hold it has on your hair, preventing premature hair loss. Myrrh essential oil is also effective in helping to stop the flow of blood, which is useful for wounds that aren’t properly clotting. Due to its antibacterial, antifungal, antiviral, and antiseptic properties, myrrh essential oil is a great way to help boost and fortify your immune system. Your body works hard to fight infections; this help takes the load off. Using myrrh essential oil as a preventive measure or when treating wounds helps prevent your body from suffering from infection. We often try to find ways to prevent sweating, but the truth is sweating is perfectly natural and healthy. In fact, sweating is absolutely necessary, especially when it comes to cooling the body down when it is overheated. Myrrh essential oil encourages sweating; helping the body rid itself of excess water, salt, and toxins. Perspiring also helps to clean out our pores and release harmful gasses such as nitrogen. Myrrh essential oil is great for the health of the stomach and the digestion process. Myrrh essential oil helps to treat such stomach ailments as indigestion, upset stomach, and diarrhea. Those suffering from gas will also find relief in myrrh essential oil. This soothing essential oil will not only help relieve gas trapped in your intestines, but will prevent it from developing the first place. Myrrh essential oil helps to promote a healthy and germ-free mouth free of inflammation. This powerful essential oil helps to relieve the mouth of inflammation due to such conditions as gingivitis and also helps to prevent gum disease. Myrrh essential oil also helps to calm down mouth sores and ulcers due to infection and diseases. Due to its antibacterial properties and its ability to freshen breath, myrrh is a common ingredient in toothpaste and mouthwash. As previously mentioned, myrrh essential oil is a natural astringent, helping to strengthen your gums and the hold they have on your teeth, helping to prevent tooth loss. Myrrh essential oil not only helps to maintain good health, but also helps to maintain a glowing complexion. Myrrh essential oil eliminates bacteria, helping to fight and stop the spread of acne on the face. This beautifying oil also helps moisturize the skin and prevent it from taking on a dry, cracked appearance. Ancient Egyptians used this essential oil to help maintain a youthful appearance as well as using it as an enticing fragrance. When used in a cold compress, myrrh essential oil can help treat painful inflammation and swelling. Myrrh essential oil is also known to help with inflammation in the tissues associated with infection. Myrrh essential oil may also help soothe an inflamed digestive system after indulging in a spicy meal. Myrrh essential oil helps support blood circulation, helping blood reach all corners of the body, ensuring all tissues and organs are properly oxygenated. This also helps your body attain a healthy metabolic rate and helps ensure a strong immune system. When your body enjoys proper circulation, nutrients and oxygen circulate around the body and keep things running smoothly. Myrrh also helps soothe any tightness or heaviness in the chest. 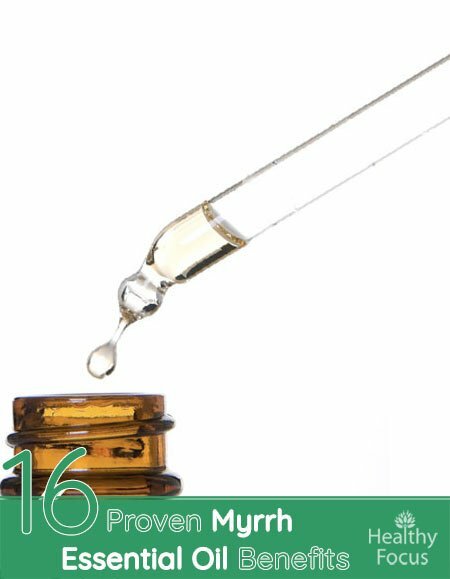 Consider adding this essential oil to your treatment routine when treating a cough or a cold. Myrrh essential oil works in a number of ways to ensure wounds, scrapes, cuts, and burns heal quickly and without infection. It’s powerful antibacterial, antifungal, antiviral, and antiseptic properties keep the affected area free from germs and any potential invaders while myrrh’s astringent properties encourage blood clotting to help stop the bleeding. Overall, myrrh essential oil helps promote a speedy and healthy recovery. Keep a little vial of this powerful essential oil in your first-aid kit for a quick and natural way to heal your minor injuries. Myrrh essential oil may potentially be a natural treatment for an underactive thyroid or hypothyroidism. Myrrh essential oil may be a potentially effective treatment because it helps to alleviate stress and therefore helps to take the pressure off of an overtaxed thyroid. To help decrease the symptoms of hypothyroidism, add a couple drops directly onto your thyroid every day. This smoky and sweet essential oil is a great oil for aromatherapy, promoting rest and relaxation. Consider adding a couple drops of this oil to your diffuser or including it in your next relaxing bath or massage. Myrrh essential oil is wonderful on its own, however, when combined with other essential oils, the possibilities are endless. If you are looking for a great aromatherapy blend to promote peace of mind or are looking to treat a wider range of illnesses, consider blending myrrh with other essential oils. Myrrh essential oil blends well with tea tree, thyme, rosewood, patchouli, sandalwood, lavender, palmarosa, and frankincense. Studies have found that myrrh essential oil can possibly help inhibit the growth and spread of cancer cells. One 2011 study found that myrrh essential oil help stopped the growth of 8 different cancer cells–this was especially true for gynecological cancer. Although these preliminary studies are promising, further scientific research needs to be performed to confirm these results. Myrrh essential oil may also help with skin cancer. Preliminary studies have found that a couple drops placed directly on the affected area may help stop the spread of cancer. Myrrh essential oil may potentially be a good supplement to other traditional cancer treatments. More scientific research needs to be conducted to confirm this particular treatment. Myrrh essential oil is not recommended for the use of pregnant women. This essential oil can possibly start uterine contractions in women with child, so its best to avoid this essential oil while pregnant. Some people may experience gastrointestinal distress when taking myrrh essential oil internally. Although generally not serious, some people may experience an upset stomach or diarrhea. If you experience these symptoms, discontinue its use. People with sensitive skin may want to use myrrh essential oil with caution. Some people experience dermatitis and inflammation of the skin after using this oil, so be sure to do an allergy test before using myrrh essential oil to make sure you do not suffer from an adverse reaction. Some people experience dermatitis and inflammation of the skin after using this oil, so take care. Myrrh essential oil is not suitable for the use or pregnant women or women or who are nursing. Anyone who suffers from a heart condition should either avoid myrrh essential oil or speak to their physician prior to as it may encourage heart irregularities and low blood pressure. Those suffering from diabetes or conditions involving blood sugar should avoid using myrrh essential oil since it may potentially lower blood sugar. Those who are about to have surgery should refrain from using myrrh essential oil at least 2 weeks prior to surgery because it interferes with blood glucose. Those taking medication for diabetes should not use myrrh essential oil due to a possible drug interaction. People taking Warfarin or other anticoagulants should avoid myrrh essential oil at all costs due to a potential drug interaction.